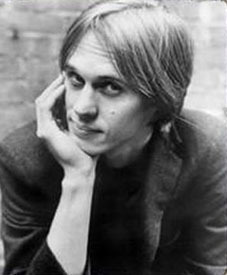 An important contributor to the development of the East Coast underground music scene of the mid-70s, Tom Verlaine (born Thomas Miller) pursued a winding musical path before arriving at the harsh, quasi-rock style that earned him his audience. Beginning with classical piano training and an interest in the works of Wagner as child, at the onset of his teen years he expanded his listening to include the free jazz of the early 60s -- the influence of players like John Coltrane and Albert Ayler prompting him to take up the saxophone and explore improvisation. A conversion to rock music and the guitar was finally brought about in his mid-teens by the arrival of British bands like The Rolling Stones. It was not long afterwards that Verlaine dropped out of boarding school, abandoning his childhood home of Wilmington in an attempt to hitch-hike to Florida; he was later returned to the school by police and completed his education, but immediately after graduation his interest in music and poetry set him on the road to New York City. Verlaine would spend several years in New York before forming the band The Neon Boys early in 1973 with high school friend Richard Meyers. As was common in the punk/underground scene of the time, both musicians gave themselves new names: the former Tom Miller adopting "Verlaine" from Symbolist poet Paul Verlaine, while Meyers took a less subtle approach and presented himself as Richard Hell. The band also included drummer Billy Ficca, another of Verlaine's former schoolmates, but scant weeks would pass before Ficca departed for Boston, resulting in the dissolution of the Neon Boys before any public presence was established. Verlaine continued to perform occasionally as a solo act, and it was one of these performances that brought him to the attention of fellow guitarist Richard Lloyd; the two discovered they had compatible sensibilities and -- with the additon of Hell and a recently-returned Ficca -- joined forces to create the band Television towards the end of '73. Shortly after making their public debut at the Townhouse Theater in March of '74, Television secured a Sunday-night residency at CBGB's -- a Bowery club that would shortly become ground zero for the East Coast punk/new wave movement. It was here that Verlaine made the acquaintance of painter-turned-poet-turned-singer Patti Smith, who was impressed enough to enlist the guitarist for her debut album Horses (1975) and several of her later projects. Despite the devoted following cultivated by Televison's live performances, the band experienced some initial difficulty in finding a record label: a Brian Eno-produced demo tape was soundly rejected by Island records in '75, and bassist Richard Hell subsequently departed (was he pushed or did he jump?) to form his own band Richard Hell and the Voidoids. Hell was quickly replaced by former Blondie bassist Fred Smith, and it was this new line-up that would create the first Television single Little Johhny Jewel, released on the independent Ork label later that same year. The interest generated by the single steadily spead beyond the confines of the underground, and a year later Television managed to land a arrange a deal with Elektra label. Their full-length effort Marquee Moon finally materialized in 1977 to an enthusiastic reception from critics -- although, apart from the devotees of the East Coast scene from which they had emerged, its most profound impact would be felt in the UK rather than in the States. An opening slot on Peter Gabriel's first solo US tour helped somewhat to broaden their homeland audience (although their presence was less than appreciated by the bulk of Gabriel's fans), but no such assistance was needed on the band's first tour of Britain, where their shows easily sold out and were given rave reviews. When the second album Adventure arrived in 1978, it was quick to find a placement in the British top 10; a wider US audience continued to elude them, however, and before this situation was able to change, creative differences between Verlaine and Lloyd brought about the dissolution of the group. Wasting no time in looking back, Verlaine returned to the studio almost immediately after Television's demise to create his eponymous solo debut, released in 1979 by Elektra. The strong critical notices and lack of mainstream success that plagued (or blessed) his former band greeted both this and the guitarist's second effort Dreamtime (1981). As had also been the case with Television, the music was given it's warmest recepetion in the UK, and after two more releases (Words From the Front, 1982; and Cover, 1984) Verlaine moved his base of operations to London. The latter half of the decade would only see one new album (Flash Light, 1987), while his seventh release The Wonder would not surface until 1990 (the two different records finding the fickle affection of critics first returning and then again receding). For his next project, Verlaine made somewhat of a return to the influences of his early life to create the all-instrumental collection Warm & Cool, issued through Ryko in 1992. That same year, a reunion with Television was organized -- although enduring only long enough for the recording of a self-titled third album and a series of UK festival appearances to take place. The band was yet again coaxed into action in 2001, however, by an invitation to perform at the Tortoise-curated incarnation of the All Tomorrow's Parties festival in East Sussex, and sporadic live activity continued over the next few years. The guitarist's recorded output during this period would be limited to soundtrack work for the comedy thriller Love and a .45 (1994) and the abortion clinic documentary On Hostile Ground (2001).